Hello! It's time for a brand new Mojo Monday sketch (#223). Julee has created a really fun sketch this week! It's back to school this week for us. I will miss having Brina at home with me, but all good things must come to an end... Today I have a birthday card for her teacher, Miss Clark, who celebrates her birthday tomorrow. My strip of pink lace (underneath the twine) was gifted to me by my sweet friend, Piali! Thanks so much! Accessories: Standard Circle and Scalloped Circle Nestabilities (Spellbinders), Cherish border punch (Martha Stewart), Tatted flower (Sister Mary), Button, Lace, Twine (May Arts), Distress tool, Foam tape, Thread, Sewing machine. Very Pretty Card, Stephanie! I'm so glad you liked the lace. This is GORGEOUS Steph! LOVE the soft feel of this and the vellum is such a great touch!! 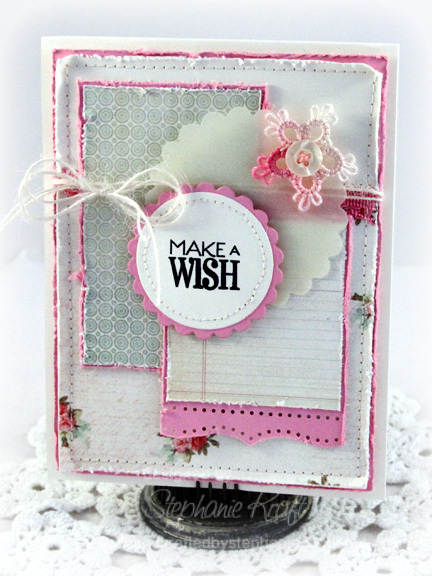 What a pretty, feminine card this is - that little crochet piece is just perfect for it! Beautiful card! So many textures that make is fabulous! This is just beautiful Steph! I love it! So pretty Stephanie! I love the soft feminine vibe and the little tatted flower embellishment is darling! Thanks for the inspiration! Ooh, Stephanie, I love this!! The colors are awesome and love the distressing!! WOW. That crocheted flower is fabulous!!! LOVE the simple print paper at the bottom--GORGEOUS!!! What a fabulous take on that sketch Steph! Love that border punch and how you inked up the lace! Saw this card in this month's Papercraft Inspirations - love it.